I'm using webstorm7.0.1 and find sometimes IDE prompts coffeescript file 'unexpected indent'. I think my code is correct, even if commenting the code lines IDE still prompts and not compile it like the following screenshot. not sure I follow you... Do you get this errors when compiling your code, or they come from WebStorm inspections? Can you compile your files outside of WebStorm? Also, can you attach a file that shows up the problem? I seem to have known the reason. The spaces and Tab are different although they appear the same! For example, two spaces and one tab appear same in my webstorm, but if there are two lines code, one is indented by two spaces, the other by one Tab, "unexpected error" will prompt and can't be compiled. It has something to do with the IDE config, i.e. Settings - Code Style - Coffeescript - Tabs and Indents - Use Tab Characters, it can't be checked. Maybe I checked it several days ago for better experience... But the problem is why it works. 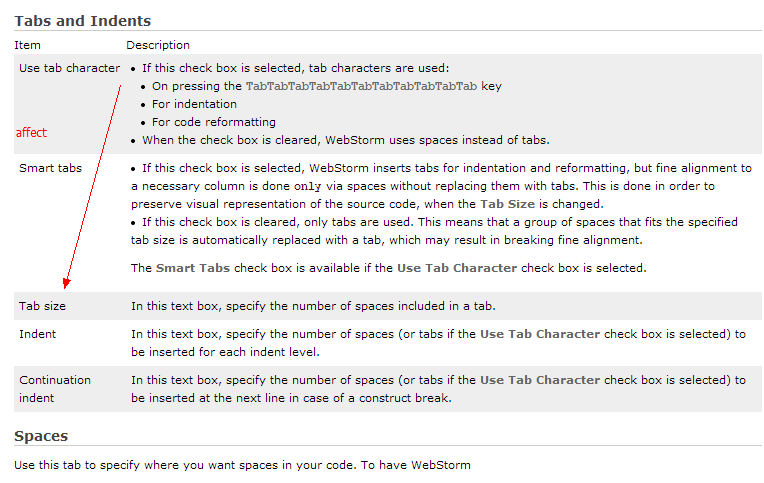 I find the official doc http://www.jetbrains.com/webstorm/webhelp/code-style-coffeescript.html I don't know why "Tab Size" is under 'Use Tab Characters' option's influence. If I checked the latter, the former would go wrong i.e. if it would not be equivalent to 4 spaces even if set 4. Sorry, I understood nothing in your report. >I don't know why "Tab Size" is under 'Use Tab Characters' option's influence. If I checked the latter, the former would go wrong i.e. if it would not be equivalent to 4 spaces even if set 4.
as you said, if a tab is set 4 spaces, why is it not equivalent to 4 times space key pressed. I press 4 times, but the coffee file can't be compiled. CoffeeScript is very sensitive to whitespace, counting a tab as a single space. so I have to uncheck 'Use Tab Characters', but I think webstorm should forbid checking the option in coffeescript code style panel.